Dr. Leonard Kundel took the "before" x-rays on October 5, 2017. At this appointment he also took a mold for my AGGA appliance, which would arrive from the lab about a month later. 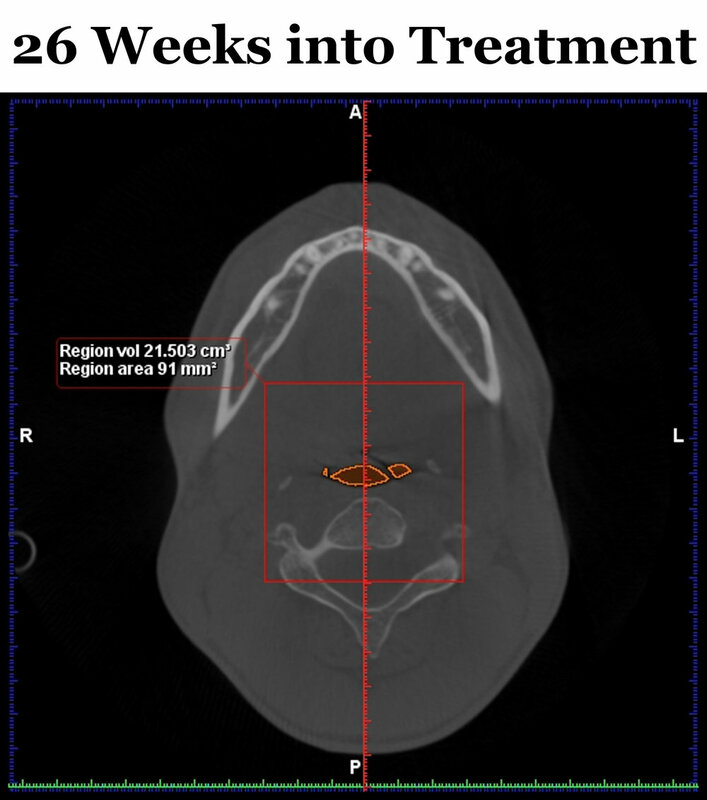 Dr. Kundel took the "26 Weeks into Treatment" x-rays on May 10, 2018 at my most recent appointment. The following two x-rays are unedited. 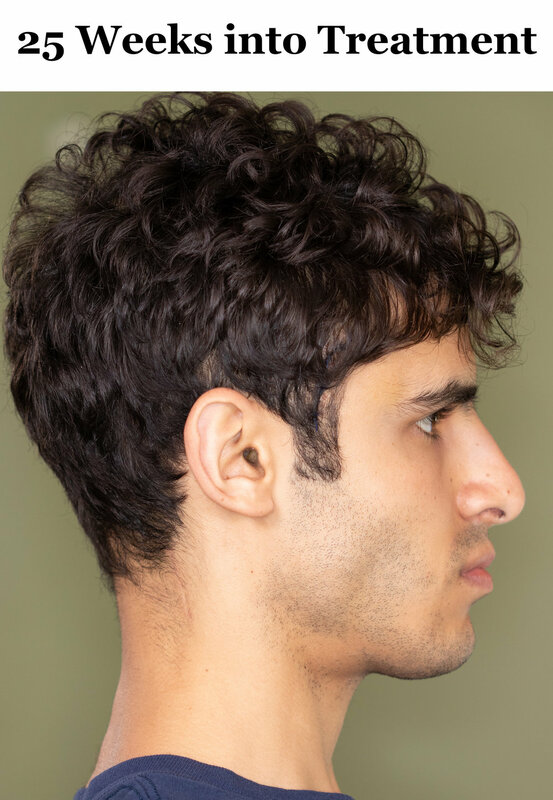 The head position you see is exactly the way the conebeam x-ray machine recorded it. You will note a significant change in my head posture in the "26 weeks" photo. The x-rays are juxtaposed with my before/after side profile photos just below them. 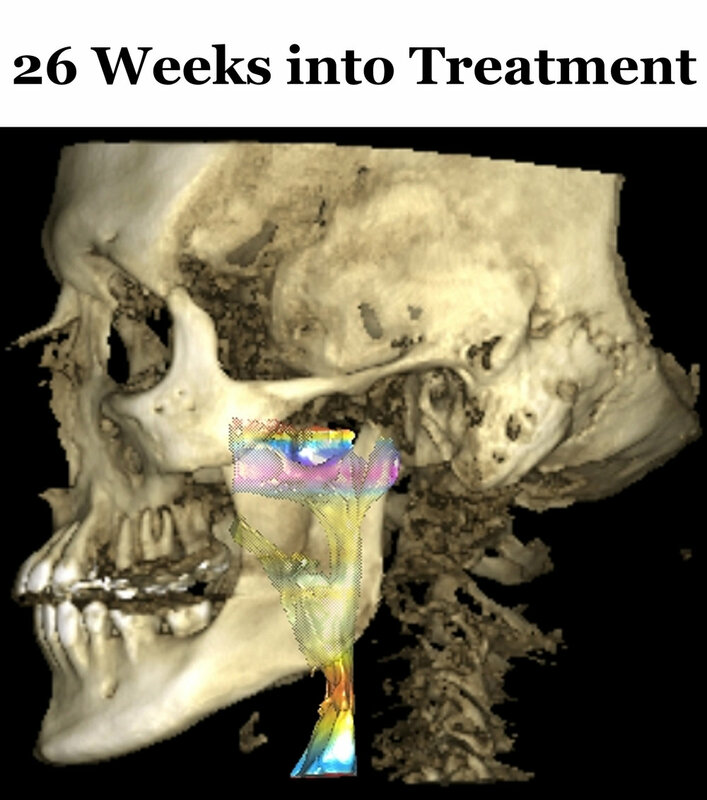 Below I have adjusted the tilt of the "26 Weeks into Treatment" photo in an effort to hold certain cranial landmarks constant in order to emphasize any changes that have occurred in the jaws and face. 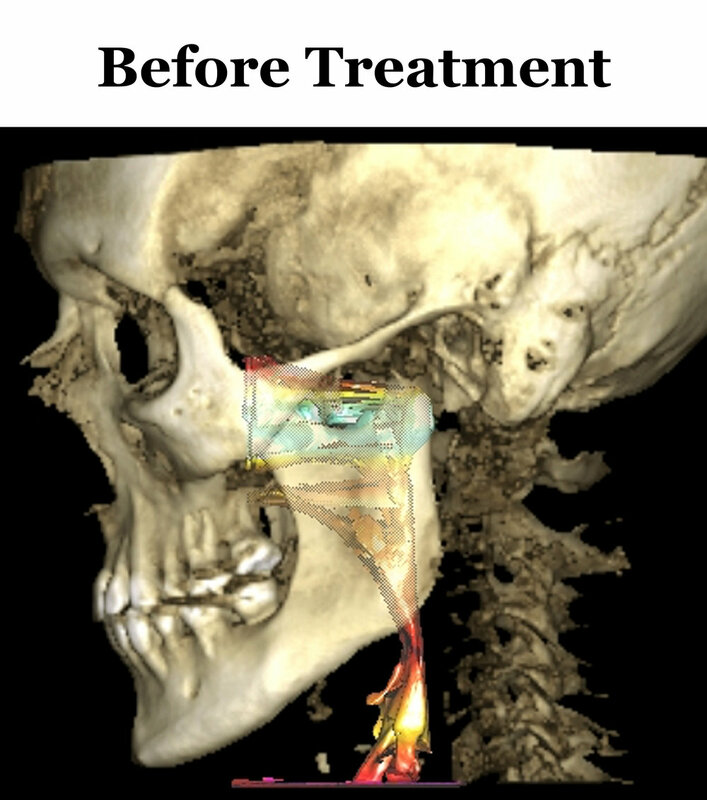 This following GIF is my best attempt to align the before/after x-rays in order to emphasize any facial growth and remodeling that has occurred. And thanks to MigraineHacks community member "seii" who created the GIF of my side profile photos just below it. Dr. Kundel's brand new, high-tech conebeam x-ray machine (which he told me cost over $100,000!) has built in software which produced the following analysis of my airway. Already my airway has increased in volume from 56mm2 to 91mm2. The multicolored columns in the above x-rays are airway indicators. The reddish kinks in the throat indicate restrictions. In my "before" x-ray the red kink is severe. In my "26 weeks" x-ray the kink is significantly improved but "still in the red," according to Dr. Kundel. Keep this in mind as you attempt to analyze these x-rays for yourself. I will remind readers that I am a patient not a dentist (although I was recently admitted to dental school) and therefore am unable to provide an authoritative analysis of the above images. Do they show bone growth? Teeth flaring? Some good changes? Some bad changes? All of the above? I don't know, but Dr. Kundel is confident enough in the results so far to post the x-rays to his Facebook page. No doubt that the MigraineHacks readers will take analysis into their own hands! I invite you to do so in the comments section below. As you know, I have not had an AGGA adjustment since March 28th (and even that was just a partial adjustment). At that time Dr. Kundel decided to pump the brakes on my AGGA due to concerns that expansion was happening too quickly in my case. Well, at my last appointment on May 10 Dr. Kundel decided it would be best to wait an additional 2 months before making another AGGA adjustment. That means my treatment will involve an almost 3-month "pause" period during which time I wear AGGA without it being tuned to stimulate growth. This period will be spent giving my body a chance to adjust to the rapid movement already caused by AGGA. Specifically it is meant to give the bone around my front teeth a chance to catch up and rebuild in light of the tremendous change that has occurred in that area. It is a countermeasure to the tilting of the incisors highlighted in prior posts. So it will be a while until I see any more changes in facial growth/remodeling. It is unlikely that during this downtime I will continue to do bimonthly photo updates as I have since the beginning of AGGA treatment. I may cut back to once a month until my next adjustment. This may give me an opportunity to address other topics I've been meaning to get to such as my recent fronto-temporal migraine surgery which was a follow-up to my hugely successful occipital migraine surgery back in December.